This report provides complete analysis of key global players in the feed binders market, with a clear insight on developments, trends, and their product portfolio. This report includes the profile of the leading players of this industry such as Archer Daniels Midland Company (ADM) (U.S.), FMC Corporation (U.S.), E. I. du Pont de Nemours and Company (U.S.), Darling Ingredients Inc. (U.S.), Roquette Freres (France), and Borregaard ASA (Norway). The current competitive scenario of the feed binders market provides valuable inputs that can validate the strategic decisions to be employed in the future by manufacturers. Due to a significant transformation towards organized farming and demand for compound feed, backyard farms and domestic feed integrators have been utilizing the services of commercial feed manufacturers. With a huge opportunity observed in the commercial feed market, feed binders are projected to play an important role in defining the quality and durability of feed in forms such as pellets, crumbles, moist, or semi-moist feeds. 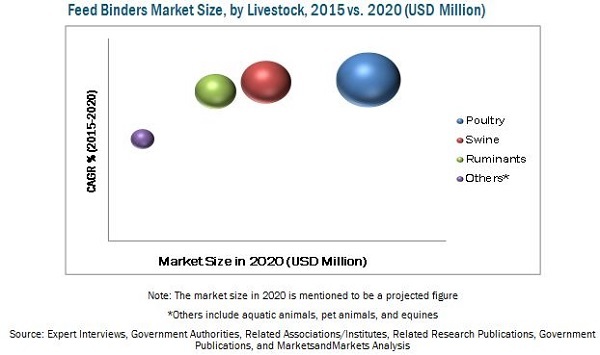 Companies engaged in the development and marketing of feed binder portfolio comprising lignin, clay, gelatin, carrageenan, and guar & locust bean gum can avail a concrete view about the market structure in key countries. The report projects the analytical and qualitative requirements for important stakeholders involved in the feed binders market, such as compound feed manufacturers & traders, feed formulators & integrators, specialty ingredient manufacturers, and pet food industries. This report focuses on the feed binders market. The research categorizes feed binders on the basis of ingredient type, livestock, and region. The feed binders market is projected to reach USD 4.96 Billion by 2020, at a CAGR of 3.4% from 2015 to 2020. Feed binders are used to bind the different feed particles together and keep a stabilized feed form. The market for feed binder products has a significant impact in the animal meat industry. Feed binders are broadly categorized based on their type into clay, plant gums & starches, lignosulphonates, hemicellulose, CMC & other hydrocolloids, gelatin, molasses, wheat gluten & middlings, and others that include PMC and urea formaldehyde. The feed binders market is also segmented on the basis of livestock into poultry, ruminants, swine, and other animals which includes aquatic animals, pet animals, and equines. Growing awareness regarding the importance of health and hygiene of livestock has been a significant driving force for this market after the immense livestock loss caused by avian flu outbreaks in Asia-Pacific countries. Binders bring about stability to feed pellets, enhance the palatability of the feed, and are also used to enrich nutrition levels. The market for feed binders in the Asia-Pacific region is projected to reach nearly USD 1.63 Billion by 2020 and is expected to remain a stronger market than European and North American regions in the next five years. The Asia-Pacific region accounted for the largest market share in 2015 and is projected to be the fastest-growing market during the forecast period. The key players in this market have been involved in the process of developing a range of customized solutions to target specific needs of livestock breeders. Thus, the feed binders market has been gaining more global presence and acceptance among customers. 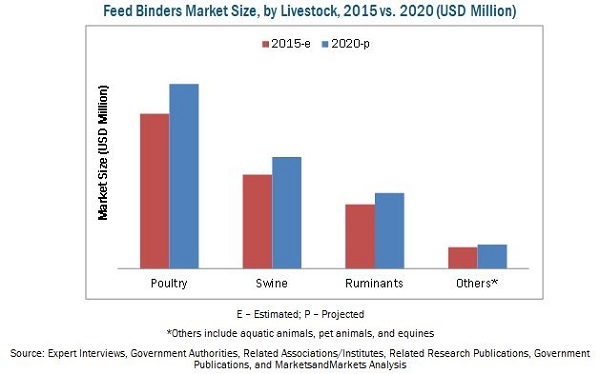 Leading participants in the feed binders market include Archer Daniels Midland Company (ADM) (U.S.), FMC Corporation (U.S.), E. I. du Pont de Nemours and Company (U.S.), Darling Ingredients Inc. (U.S.), Roquette Freres (France), and Borregaard ASA (Norway). Expansions and acquisitions have been the key growth strategies to increase the global presence of the leading players in the feed binders market. 7.1.4 Archer Daniels Midland Co.